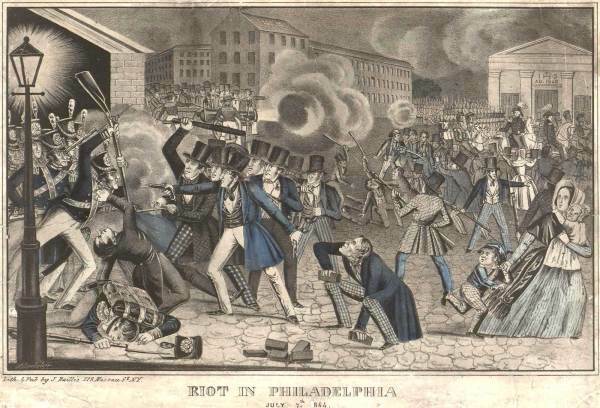 THE ENCYCLOPEDIA OF GREATER PHILADELPHIA: In May and July 1844, Philadelphia suffered some of the bloodiest rioting of the antebellum period, as anti-immigrant mobs attacked Irish-American homes and Roman Catholic churches before being suppressed by the militia. The violence was part of a wave of riots that convulsed American cities starting in the 1830s. Yet even amid this tumult, they stand out for their duration, itself a product of nativist determination to use xenophobia for political gain. In the aftermath of the riots, shocked Philadelphians began debating new methods of maintaining order, a discussion that contributed to the consolidation of Philadelphia County in 1854. Ethnic and religious antagonism had a long history in the city. Since the 1780s, Irish textile workers had come to Philadelphia after losing their jobs to mechanization in the British Isles. As early as 1828, when an off-duty watchman was killed after disparaging “bloody Irish transports,” Catholic presence had provoked anxiety among American- and Irish-born Protestants. In 1831, Irish Catholics battled along Fifth Street with Protestants celebrating the anniversary of the Battle of the Boyne. 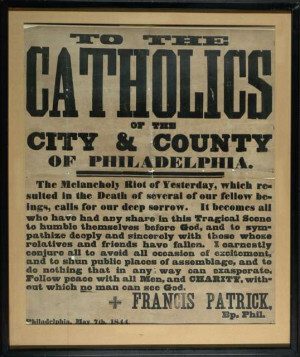 Anti-Catholic agitation increased in the early 1840s, organized in part around a perceived threat to the Bible in the public schools. Catholic Bishop Francis Patrick Kenrick (1796-1863), an Irish immigrant himself, objected to Protestant teachers’ leading students in singing Protestant hymns and requiring them to read from the King James Bible. Nativists used Kenrick’s complaints to gain followers. In 1842, dozens of Protestant clergymen formed the American Protestant Association to defend America from Romanism. In early 1843, editor Lewis Levin (1808-60) made the Daily Sun an organ for attacks against Catholicism and Catholic immigration, and in December of that year, he helped found a nativist political party called the American Republican Association. 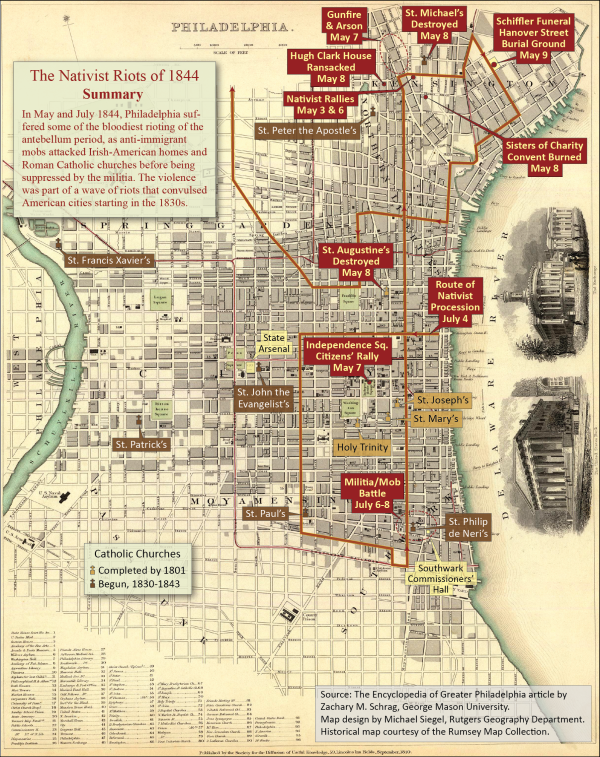 In 1844, the Bible controversy intensified in the district of Kensington, a suburb to the northeast of Philadelphia City and home to many Irish immigrants, both Protestant and Catholic. In February, Hugh Clark (1796-1862), a Catholic school director there, suggested suspending Bible reading until the school board could devise a policy acceptable to Catholics and Protestants alike. Nativists saw this as a threat to their liberty and as a chance to mobilize voters, and they rallied by the thousands in Independence Square. On May 3, 1844 they rallied in Kensington itself but were chased away. The first serious violence broke out three days later. On May 6, the nativists reassembled in Kensington, provoking another fight, during which a young nativist named George Shiffler (1825-44) was fatally shot. By day’s end, a second man—apparently a bystander—was dead, and several more nativists were wounded, two mortally. The next day, the First Brigade of the Pennsylvania Militia, commanded by Brigadier General George Cadwalader (1806-79), responded to the sheriff’s call for help. The troops faced little direct resistance, but they proved unable to stop people from starting new fires. On May 8, mobs gutted several private dwellings (including Hugh Clark’s house), a Catholic seminary, and two Catholic churches: St. Michael’s at Second Street and Master and St. Augustine’s at Fourth and Vine. Only a flood of new forces—including citizen posses, city police, militia companies arriving from other cities, and U.S. army and navy troops—ended the violence by May 10. This entry was posted on Thursday, September 24th, 2015	at 3:26 pm	and is filed under News	. Responses are currently closed, but you can trackback from your own site.